The content on this site and in the associated position paper was written by Edwin Hayward. 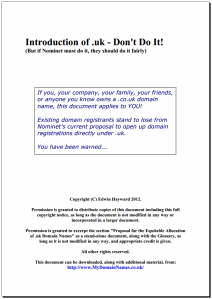 I am a director and co-owner of 2 UK Ltd companies that stand to be directly impacted by Nominet's proposal, Memorable Domains Ltd and Maps Ltd.
My involvement in the domain name industry started in 1996 when I established the world's first dedicated domain name news and information website, iGoldrush.com. I sold this website to its current owner in 2000, but I have remained active in the industry ever since. I have presented on panels at a number of domain conferences, most notably the MeetDomainers show held in Manchester in August 2010, and the TRAFFIC ccTLD conference held in Amsterdam in June 2009. I have also exhibited at Internet World in 2008 and 2009. On occasion, I have featured in the media on domain name issues, going back to news reports by CNET.com in 1997, and I am referenced in "The Domain Name Game", a book by David Kesmodel. Time is running out... To find out more about this issue, and how your business is likely to be affected, please download the position paper.